U.S. Lighthouse Society Passport Program – Chesapeake Chapter U.S.L.H.S. 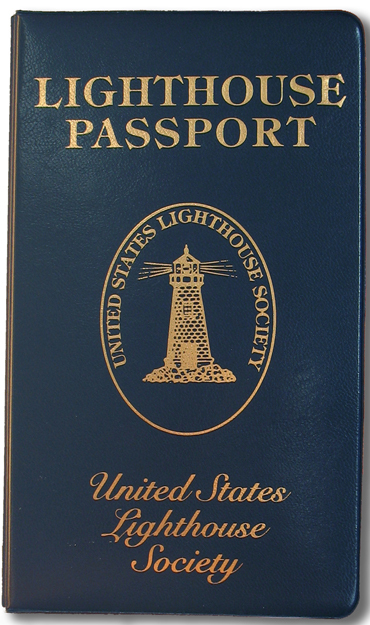 The United States Lighthouse Society sponsors a Lighthouse Passport Program. A passport with a blue vinyl cover, similar in appearance to an official United States passport, is available through our Chapter and the Society. When you visit a participating lighthouse, you can get your passport stamped. When you have completed the book with 60 stamps/photos, send it, or a photocopy of the pages to the USLHS headquarters in Hansville, Washington for verification. You will receive an official patch in return. The more books you fill up, the more patches you can earn! You can also join the Society’s Passport Club at no charge and receive an electronic newsletter full of tips on where to find the stamp and updates on lighthouses joining the program. This program is designed to help support lighthouse preservation, which is why the U.S. Lighthouse Society requests that you donate a minimum of $1.00 to each lighthouse, in exchange for a stamp. Our Chapter maintains stamps for several lighthouses, which are listed below. We request a $1.00 donation for each stamp image requested. The money collected is deposited into the Chapter’s preservation “H.E.L.P.” fund. Are you a member of our 40+3 Club? Click Here to order your passport stamps today. Click here for details and list of ALL participating lighthouses. Download Digital Stamps Pay Via [wpshopcart_category_products_fancy id=”4″ style=”3″] Click here to add items from our Loft! CLICK HERE TO ORDER THE STAMPS AND PAY BY CHECK OR MONEY ORDER Additional donations are always welcome to cover overhead expenses and support expansion of our programs.